Ever made the mistake of asking a kitchen full of hungry stomachs “who wants what?” We‘ve been giving it a lot of thought, so the next time they ask for French toast… ham sandwich on a mini roll… turkey cheese melts… pretzels… and eggs - you can give em’ a single mouthwatering answer. Monte Cristo Pretzel Sliders! 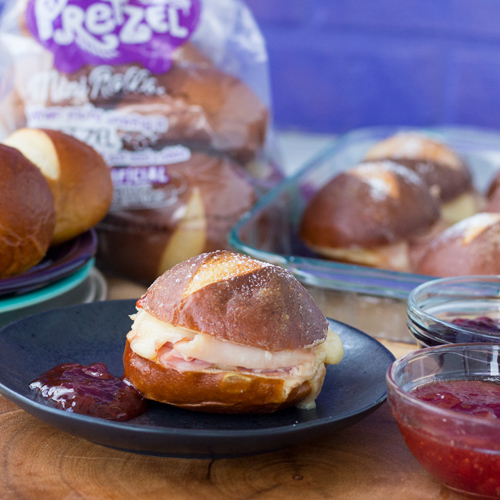 Proof once again that our Pretzel Mini Rolls can make the impossible, possible. The legendary Monte Cristo sandwich is already a bit French toast, a touch ham sandwich, a smidgen of turkey melt, and, of course, egg. But it’s not a pretzel, and that’s where we come in. Grace Baking scores another big, big win. Monte Cristo Pretzel Sliders are very likely a milestone of modern civilization… but it’s just another delicious day in the bakery for us. Preheat oven to 350ºF. Spray an 11-inch baking dish with nonstick cooking spray. Slice the pretzel mini rolls in half. Spread Dijon mustard on bottom half of each roll and place in the baking dish, mustard side up. Layer half a slice of cheese, one slice each of ham and turkey, and second half cheese slice on roll bottoms. Cap with roll tops. In a small bowl, whisk together melted butter and egg. Brush the mixture onto the tops of each slider and cover with foil. Bake for 15 minutes, then remove foil and bake another 7-10 minutes. Remove from oven. Sprinkle with powdered sugar and serve with grape or strawberry preserves.